David Lynch said this when prompted on the extensive examination of memory in his cinema. While Lynch’s films deal with memory in the abstract, the quote is no less applicable to films which relate to memory more directly, in the real. In fact, it may be more profound in this context. When we discuss political cinema, we have to remember it is a cinema that is centred around memory. There is no political event or occurrence or position or idea that is not rooted in a lengthy and complicated past. This is an idea that takes centre stage in Radu Jude’s remarkable and frustrating political film, I Do Not Care if We Go Down in History as Barbarians. The title of the movie is a direct quote from fascist Romanian leader Antonescu, whose actions and words, Jude contends, have been conveniently forgotten by his own countrymen. 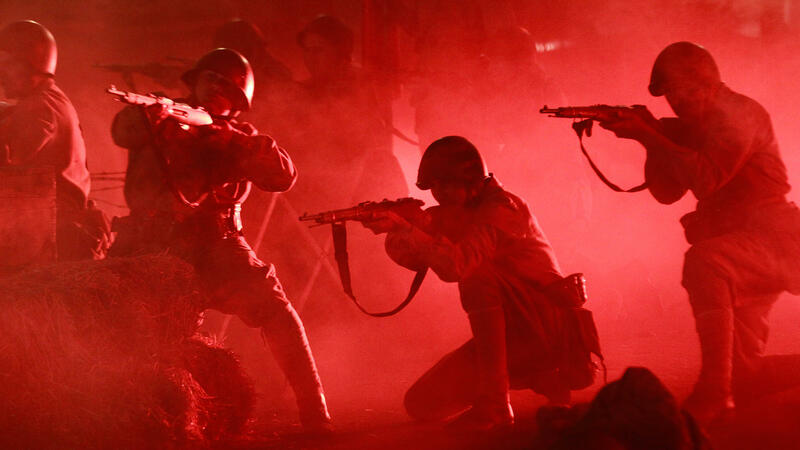 The film centres around a young director named Mariana, who is putting on a live re-enactment of the 1941 Odessa Massacre for Romanian Independence Day. A passionate and politically charged artist, Mariana uses the opportunity to confront Romanian officials and audiences with the nation’s involvement in the Holocaust, particularly the mass murder of Jews in Odessa. The film is deliberately framed as a meta-narrative where Mariana’s struggles, ideas, and central conceits mirror those of Radu Jude. The film begins with the actress, Ioana Iacob, introducing herself as her character and hopes out loud that the audience enjoys the movie. The film then continues without any clear barrier separating the “real” from the “narrative”. This wasn’t merely a gimmick. The production history of the film frighteningly reflects the story of Mariana in more ways than one. Mid-way through the shoot, Jude and his producer Ada Solomon almost had to shut down production indefinitely, something which happens to their central character. Mariana represents a type of person many of us have seen amidst discourse on the rise of fascism: the good faith arguer. It’s a noble position to have, and an endlessly frustrating one because to argue in good faith is to maintain a civility and genuine openness to discussion and debate around a topic which really only has one morally righteous side to it. It is why Jude’s depiction of the slow creeping spectre of nationalist rhetoric is so difficult to watch. We see Mariana throughout the film time and again justifying something which should be obvious: the genocide of Jews by Romanian hands deserves a reckoning. Yet Mariana, through her moral positioning and belief in the idea that art can and will change minds, takes on all comers and gives them ample room to make their case; a case which, as all fascist rhetoric goes, is riddled with non-sequiturs and disingenuous talking points. This willful ignorance displayed by several characters in Barbarians is a damning statement on how nationalism conditions people into only remembering the positive moments of their nation’s history. Jude already assumed the memory of the Odessa Massacre may be refuted if told through fictional narrative recounts, which is why his 2017 companion piece, The Dead Nation, wipes away any doubt in Barbarians’ historical truth. The heartbreaking documentary is a montage of still photographs from the 1940s accompanied by Jude’s reading from Jewish doctor Emil Dorian’s diary recounting the events of the Romanian Holocaust. In an article in The Wrap, actress Ioana Iacob recounts that she barely remembered anything regarding the Odessa massacre being taught in her school. It was a piece of history which Romania willingly chose to forget and made sure that future generations did not learn about. It is disingenuous of course, but that’s what fascism is built on. The erasure of memory and the propaganda of lies repeated enough times that they become accepted truths.